A pencil sketch of Looe showing the Polperro road (A387)and bridge across the river Looe. 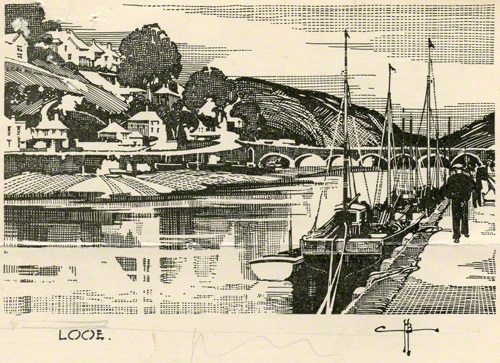 Another pencil drawing of Looe by Claude Buckle this time closer to the bridge that connects West Looe to East Looe. Quite large boats are still able to tie up on the Jetty near to the bridge as the picture shows. This image has been taken from the menu card. Created in 1933.